Over the next few weeks, as time permits, we will try to recover the articles from our old website, which was destroyed by hackers. They may not be the right order, and some of the images may have been lost, but the stories will help us remember. The following two articles are from 2012 and describe a direct action some of us have been involved in several times. It would be wonderful if we didn’t have to do it again in 2017! SCADP Board members Ron Kaz, Kate Webb and Anna Shockley and volunteer Elaine Cooper traveled to Washington, D.C. for the Abolitionist Action Committee’s direct action on Tuesday, January 17, commemorating the execution of Gary Gilmore, the first execution since reinstatement of the death penalty. 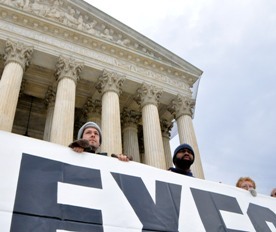 While Kate and Elaine provided support services and took part in a legal demonstration on the sidewalk, Ron and Anna, along with twelve others, unfolded a 30 foot banner that said “Stop Executions” on the steps of the U.S. Supreme Court. Ironically, this is an illegal act. (“Free speech stops on the steps of the Supreme Court,” a police officer once told us.) Supreme Court police arrested all fourteen protesters. The banner was up for over twenty minutes before the Supreme Court police had arrested all of us and collected it. The officers who booked us were extremely polite, but inflicted considerable pain on us by keeping us in very tight plastic handcuffs for nearly four hours. They also took our coats, sweaters, and sweatshirts, claiming that we were only allowed to have one layer of clothing. When we arrived at “central lockup,” we were told that this was incorrect and we would have been welcome to have our clothes. With the exception of the first such action in 1997, protesters at the Gilmore action have been held in “Lockup” overnight. In 2007, we were taken to the city jail the next morning and kept until our arraignment that evening. This time, all of the women (repeat offenders Rachel Lawler and Anna Shockley and new recruits Amber Mason, Anne Feczko, Charity Lee and Eve Tetaz) and Randy Gardner were released by 7:00 the same night. Kevin Mason and Tom Muther were released soon afterward. Five people, Ron Kaz, Scott Langley, Jack Payden-Travers, Daniel Flynn, and Jon Dunn had given their names as Troy Davis. The city police officer who released us (the women) told us that they might have to keep them overnight, because they could not do background checks on them. However, by 10:30pm they had found information on Ron, Scott, and Jack, who had been arrested for this action in previous years, and the three men were also released. Only Daniel and Jon remained in jail overnight and were not released until after our arraignment the next evening. We will have a status hearing on February 8 and a trial at some time in the spring. Some of us had to travel long distances for this action and will have to do so again at least for the trial and possibly for the status hearing. If you can contribute even a small amount toward travel expenses, please contact Scott Langley at scott(at)abolition.org. Also please read Scott’s article about the action, below, and the report in the Washington Post, and if you want to help us in our work to abolish the death penalty, please email anna(at)charlestonpeace.net. WASHINGTON, D.C. – Thirty-five years after the first execution under contemporary laws of Gary Gilmore, fourteen members of the Abolitionist Action Committee were arrested at the U.S. Supreme Court on Tuesday. 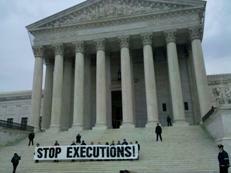 Just after 10:00 am, at the exact time that Gilmore was executed, the group unfurled a 30-foot banner that read “STOP EXECUTIONS!” on the stairs of the Court. The group included several murder victim family members, family of the incarcerated, and national leaders in the death penalty abolition movement. One of the participants who was arrested was Randy Gardner, whose brother, like Gilmore, was executed in Utah by firing squad. Three of the five men who identified themselves as Troy Davis were released the same day along with the six women who were arrested in the protest. Two of the men were held overnight in DC’s Central Cell Block because fingerprinting did not reveal their true identities. The two men, Daniel Flynn and Jon Dunn, were brought before a judge more than 30 hours after their arrest in leg and arm shackles. When asked by the judge for their names, they replied, “I was arrested as Troy Davis,” and then proceeded to reveal their true identities. Flynn and Dunn were released by 5:00 pm on Wednesday to join with the other 12 who had been released the night before. Those arrested were Anna Shockley (South Carolina), Ron Kaz (South Carolina), Rachel Lawler (Vermont), Tom Muther (Kansas), Amber Mason (Washington, DC), Kevin Mason (Washington, DC), Jon Dunn (New Mexico), Jack Payden-Travers (Virginia), Scott Langley (New York), Randy Gardner (Utah), Daniel Flynn (Washington, DC), Anne Feczko (Washington, DC), Charity Lee (Texas) and Eve Tetaz (Washington, DC). 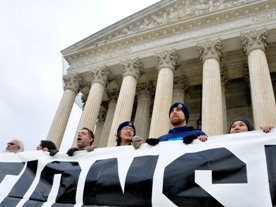 Since 1997, a total of 48 arrests have been made of people unfurling banners that read “STOP EXECUTIONS!” on the stairs leading to the front doors of the U.S. Supreme Court. The protest takes place every five years, on the January 17 first execution anniversary. Thirty-five years ago, on January 17, 1977, the State of Utah shot to death Gary Gilmore, who “volunteered” to be killed in revenge for his murder of Ben Bushnell and Max Jenson. This state-assisted suicide was the first execution under the Supreme Court’s upholding of the death penalty in 1976. Since then, there have been 1277 more executions, with more than 3200 currently on death rows in 34 states. The protest is organized by the Abolitionist Action Committee, an ad-hoc group of individuals committed to highly visible and effective public education for alternatives to the death penalty through nonviolent direct action. The Committee also organizes a four day fast and vigil on the Supreme Court sidewalk, where it is perfectly legal to demonstrate. The vigil event takes place every June 29 through July 2, and all are invited to participate. See www.abolition.org for more information on the group’s programs and activities or to make a donation to support the work for abolition. All funds will be used to help support the trial of the “Supreme Court 14” and the fast and vigil this summer. Contact: aac@abolition.org or P.O. Box 89, Ghent New York 12075 USA.